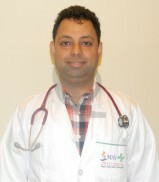 Dr. Sachin Pandove, MBBS, MD, is a Consultant - Internal Medicine at Max Hospital, Mohali. Prior to this, he had career stint as a SMO in Cardiology Department at Fortis Heart Institute Mohali & junior emergency medicine consultant at Dayanand Medical College & Hospital, Ludhiana. Besides, he was associated with a number of leading Hospitals of Mohali viz., Gracian Super Speciality Hospital, SGHS Charitable Hospital & Cosmo Hospital as a Consultant Physician. Dr. Pandove is an alumnus of Government Medical College, Patiala, from where he completed his basic medical studies(MBBS) and post graduation in Medicine. To his credits, he has a number of research papers to his name in various reputed journals.